Once we already reviewed a thin client, NComputing L300, that provides and secures a connection to the server where single-purpose vSpace software is installed. Today we will review another model made by the same vendor, N400, that allows establishing connection to the current Citrix corporate servers and does not require installation of any special purpose software on them. 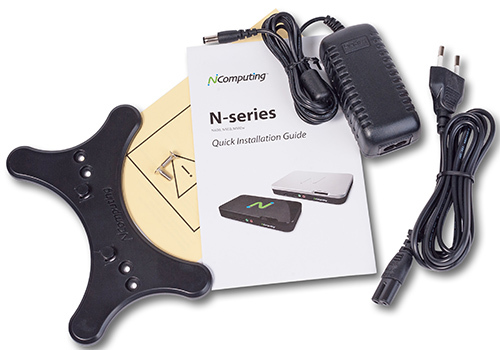 We will try to deal with all device capabilities and features to provide you, our readers, with a detailed review of NComputing N400 terminal client. 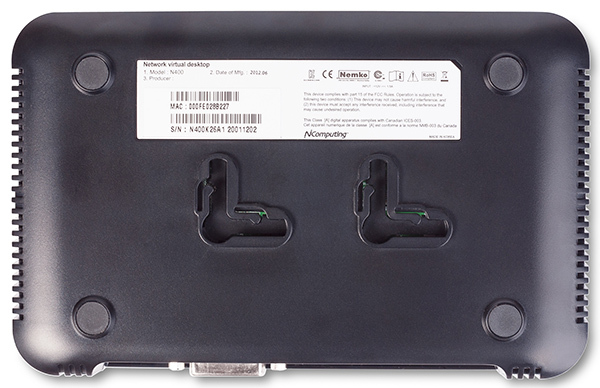 NComputing N400 terminal client comes in a black plastic case with dimensions of 181x115x31 mm. To work properly it needs an external power unit with the following characteristics: 12V and 1.5А. The client front panel has an ON/OFF button, two USB 2.0 ports, audio input and output, and brand tag located on it. Side panels are ventilation grates. The upper panel is glassy and does not have anything remarkable on it apart from a 3D brand tag and LEDs that indicate status of the device and local network connection. The rear panel has two USB 2.0 ports for a mouse and keyboard, Ethernet port, DVI slot for monitor connection, power socket, and Kensington lock. It's worth noticing that there is also a socket that is intended for connection of an external antenna, but N400 doesn't have a wireless module and one can get connected to wireless networks only using N500w model. The bottom of the device has four rubber legs used for table mounting, L-shaped mounting holes that are used to mount the device on the wall or monitor, and a sticker with brief information about the client. The electronic stuffing of N400 is one green textolite card which has all essential elements located on one of its sides. 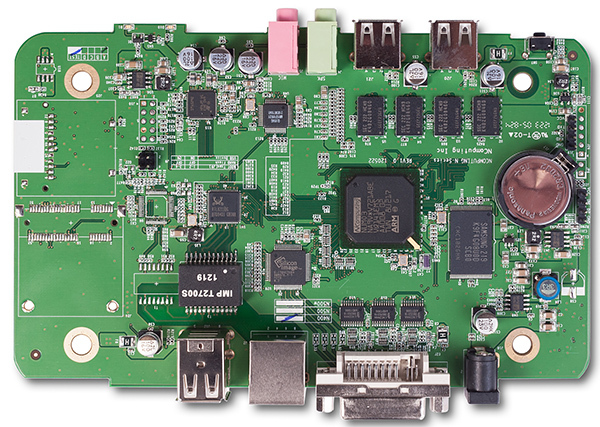 N400 terminal client is powered by NComputing NUMO3 SoC chip. Its block diagram is presented below. 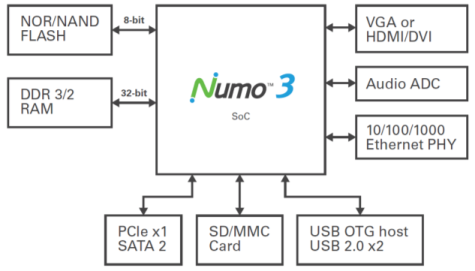 NUMO3 is powered by dual core Cortex A9 ARM CPU that operates within 2 GHz frequency. 512 Mbyte Samsung K9F4G08U0D functions as the flash memory. Four DDR3 K4B2G08460 chips, 256 Mbytes each, are used as the device's RAM, making the total RAM capacity 1 Gbyte. Network support is carried out by Realtek RTL8211DG module, while Silicon Image SIL164CTG64 maintains operation with graphic data. Firmware update is carried out by using Device tab in the device graphical interface menu. One needs to specify the link to the new firmware file and, if it's necessary, the login and password for the service. It's worth noticing that newer firmware versions have an updated design and different number of tabs. To update the firmware in newer versions one needs to use General menu item or Firmware/Wallpaper Update menu sub-item in Management tab. Beginning with versions 1.4.1.1 or later the administrator can update the firmware not only via remote servers over the web, but also from local data carriers that are connected to the USB ports of the thin client. Apart from all firmware update methods we numbered above, there is another one that is carried out using vSpace Management Center—a utility intended for centralised management of several thin clients. 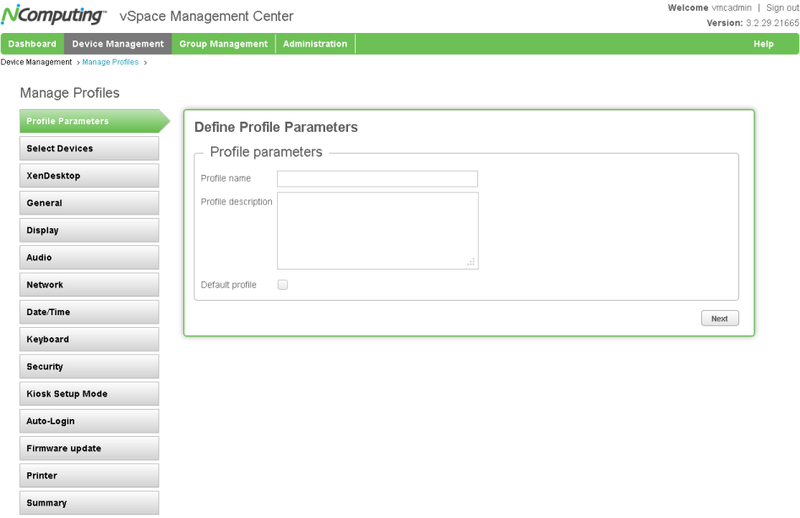 To bind a certain device to vSpace Management Center one needs to address the same-named sub-item in Management tab and specify the name or IP-address of a server where the applicable software is installed. One can access the software in question using any modern browser. Using vSpace Management Center the administrator can control the number of thin clients within the network, alter their settings and manage profiles, create device groups and manage them, and centrally carry out any other procedures associated with management of thin clients. 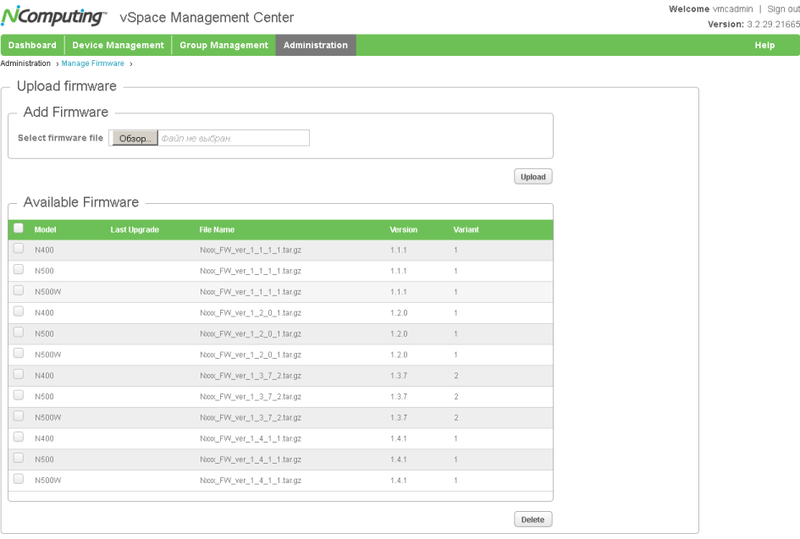 To update the firmware using vSpace Management Center the administrator at first needs to use Manage Firmware tab, Administration menu, where s/he needs to upload the firmware file to the system, choose the firmware and device using Update Firmware tab, Device Management menu, and plan the update procedure out. Now let's pass on to reviewing the graphical interface capabilities. As soon as the monitor, keyboard, and mouse have been connected, the user will find him/herself at the graphical interface of N400 thin client, design of which mainly depends on the firmware version installed on the device. 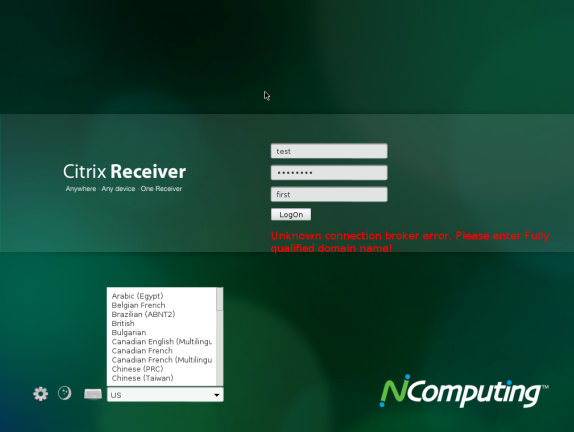 On the home screen in the graphical interface the user can specify his/her login, password, and domain name, which s/he will need to specify upon connection to the Citrix server. By clicking on the button with gear one can manage N400 settings, while the round button with the C-Moon image puts the device into sleep mode. The administrator is provided seven options for management of the thin client: Citrix, Preferences, Network, Security, Management, Peripherals, and Information. 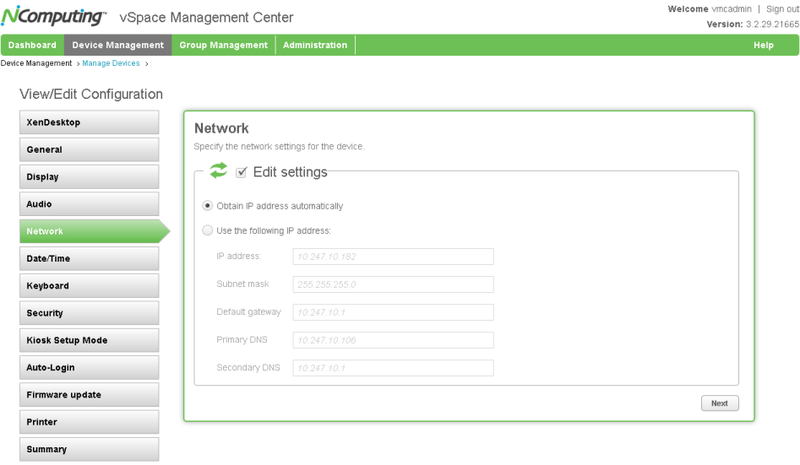 Citrix tab allows one to manage parameters of access to the Citrix infrastructure. Items in Preferences tab allow the user to change screen resolution, manage the standby time after which the device switches to sleep mode, and manage time sync. Network tab lets one manage network parameters of NComputing N400 thin client. Using Security tab one will be able to alter parameters of access to various tabs, manage installed certificates, and permit or deny control over the thin client via VNC. The user can also manage parameters of pass-through authentication via Imprivata over here. 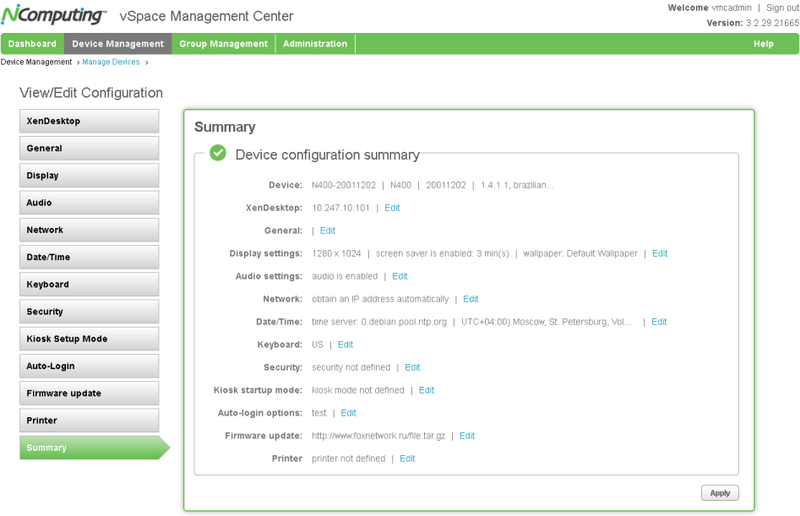 Management tab allows the user to change the device name, update the firmware, or establish a connection to the vSpace Management Center. Parameters of peripheral device connection are located in groups of Peripherals tab. Over here the user can manage connection of ear/headphones and mic, printers and scanners, as well as other COM and USB devices. Brief information about the device is located in Information tab. That is where we bring a brief review of the graphical interface capabilities to a conclusion and pass on to testing NComputing N400 thin client. The first testing procedure we usually begin our testing section with is estimating the booting time of the device, which is a time interval starting with the moment when the power is on until the first echo reply is received through ICMP. 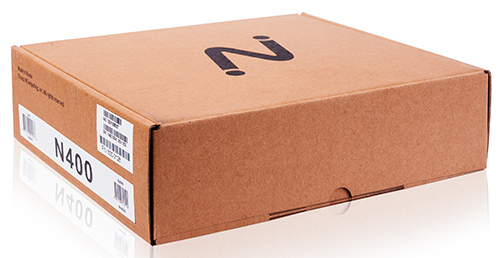 NComputing N400 boots in 44 seconds. We believe that this result is decent. 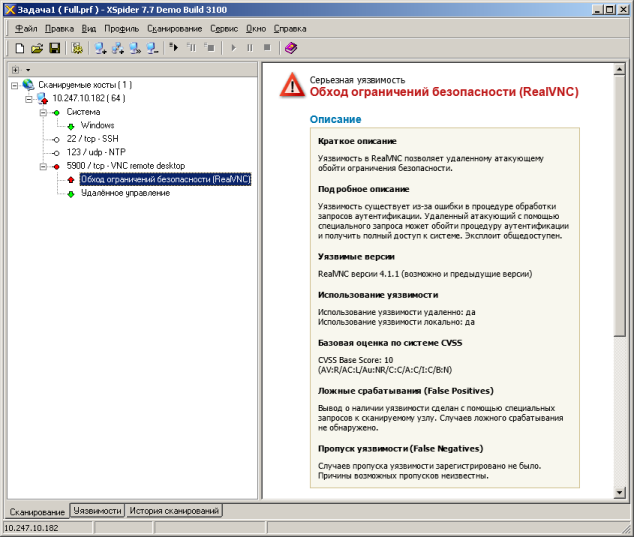 The second test was a security scanning procedure which has been carried out using Positive Technologies XSpider 7.7 (Demo build 3100) utility. On the whole, there were three open ports discovered, and they are TCP-22 (SSH), UDP-123 (NTP), and TCP-5900 (VNC remote desktop). The most interesting data are presented below. We created Citrix infrastructure on the test PC and used Microsoft Hyper-V technology for virtualisation. We tried to work with various apps, speak over Skype, and watch movies in HD within the virtual infrastructure. We didn't experience any problems at all. Well, apart from rare short freezes in the soundtrack while watching HD films. NComputing N400 thin client supports operation not only with head/earphones and mic, but also with various USB devices: printers, scanners, and flash cards. We decided to connect a 750 GB Transcend StoreJet 25M3 data carrier to it with one partition formatted into NTFS to check its data access speeds from the guest OS. To do that we used Intel NASPT 1.7.1 utility. Unfortunately, at the end of Office Productivity and Photo Album tests we received errors (and therefore one can see 0 specified for these tests on the diagram), but we believe that this is not a serious problem. Since the speeds we received cannot really be called high, we decided to change N400 for a test notebook with pre-installed Citrix Receiver app. Results of these measurements are also presented on the diagram below. 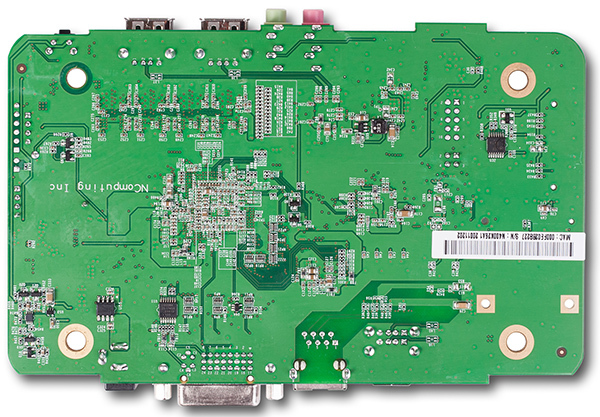 We were left a bit puzzled after reviewing NComputing N400 thin client. On one hand, this is a small and exquisite device which is really easy to manage, but on the other hand, the adjustment of Citrix infrastructure is not an easy thing for sure. We would recommend using Citrix models of thin clients either to companies that have a professional Citrix system expert on their staff or to those businesses that already have this kind of infrastructure established. The initial adjustment of this environment for connection of N400 may get to be a real palaver. An example of how to carry out these adjustments is provided in the guide that is located on the vendor's website. 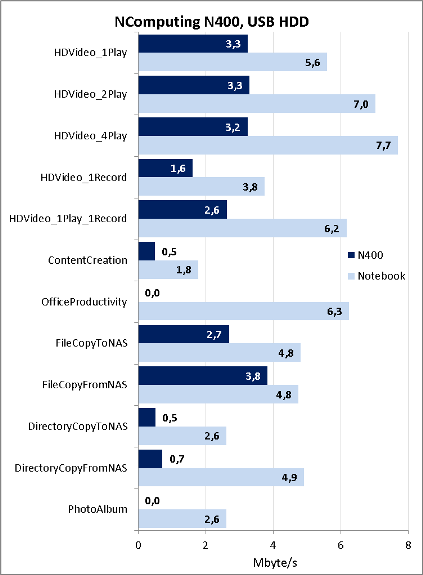 Among the strength areas of NComputing N400 thin client are the following. As of when this article was being written, the average price for an NComputing N400 thin client in Moscow online shops was 5200 roubles. The author and editorial staff are immensely grateful to technical assistants from Tayle company (www.tayle.ru) for invaluable help with preparation of this review.